Based on two observational data sets in China from 1956 to 2004, wind speed changes are analyzed. The annual mean wind speed (MWS), days of strong wind (SWDs), and maximum wind (MW) all show declining trends over broad areas of China. Only in the southeastern Tibetan Plateau and the regions from the Great Bend of the Yellow River southward to Yunnan and Guangxi Provinces wind speeds are not significantly reduced, but rather, in partial, these regions’ winds speeds are slightly increased. The regions with declining trends match the areas with relatively strong observed winds and the regions without significant declining trends match the areas with light observed winds. In the meantime, the regions with relatively strong winds correspond to areas of reduced days of SWDs. Trends for both increasing intensities and for the number of days of light winds both impact the installation of wind energy facilities. These may be advantageous to the development of wind energy in different regions. Urbanization, the change of anemometers, or relocation of stations are factors that are mildly responsible for the decreasing trend of MWS. The main reason for the decreasing trend is that under the background of global warming, the contrasts of the sea level pressure, and near-surface temperature between the Asian continent and the Pacific Ocean have become significantly smaller, and the east Asian trough has shifted eastward and northward, and has weakened as well. Both East Asian winter and summer monsoons are decreasing, and all of these impacts have resulted in declines of MWS in China. The data are provided by China Meteorological Administration. The authors sincerely thank Xunying Wu, Jingwei Xu, and Zunya Wang for their assistance with data processing and their constructive comments to improve the manuscript and especially thank Dr. Marco Gemmer who edited the English for style, accuracy, and consistency. We would like to thank three anonymous reviewers for their helpful comments and suggestions on the manuscript. 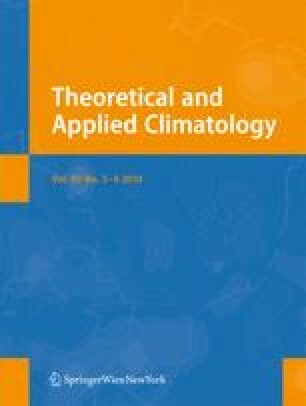 This research was jointly supported by the Special Public Research for Meteorological Industry (GYHY 200806009), Wind Energy Resources Detailed Survey and Assessment Work, and EU-China Energy and Environment Program (Europe Aid/123310/D/SER/CN).